What kind of Workshop/Show are you looking for? Have you ever seen a comedy show where you’ve found yourself being poked in ribs by your colleague sitting next to you, saying repeatedly “THAT IS SO YOU”? Well, when you invite the award winning Baram and Snieckus to perform at your next event, you’ll feel like the whole show IS just for YOU! In the style of the famous TV show Whose Line is it Anyway?, Toronto’s top performers will incorporate the goals and objectives of your organization into their improvised sketches through their unique brand of interactive comedy. Your group never sit back uninvolved because they are always part of the show. Whether it’s simply using audience suggestions based on your conference themes or inviting your colleagues to come up on stage with them to create a brief bit of hilarity, this dynamic duo weave together the kind of fun your group will be talking about long after your conference is over. 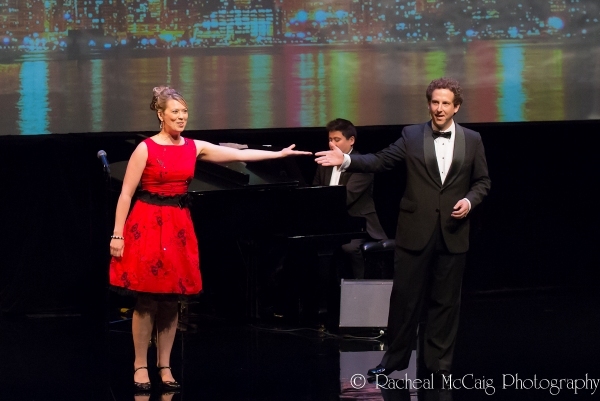 Baram and Snieckus performing live at the Bluma Appel Theatre in Toronto. "Wildly entertaining. They make improv comedy non-threatening and something that you want to participate in. The dynamic of the performers on stage is incredible, and I would highly recommend them for a corporate function." "A wildly entertaining group that makes improv comedy non-threatening, and something that you want to participate in. The dynamic of the performers on stage is incredible, and I would highly recommend them for a corporate function." This is an opportunity to learn through laughter. The National Theatre of the World facilitators use inspiring improv exercises to demonstrate the importance of saying “yes” in life and in business. But unlike some keynote speakers who talk AT their audiences, these award winning improvisers expect their audiences to share their feedback in real time in this highly interactive keynote experience. Some of what Baram and Snieckus teaches is in the form of brief comedic demonstrations. But most of what they deliver is in the form of lively exercises designed to get your whole team on their feet interacting with one another. Our facilitator’s patented communication exercises will have your team laughing and learning at the same time while marvelling at how fast the day flew by. Each exercise introduces another tool that can be used to foster effective and efficient communication, creative thinking and stronger team building. "You did an incredible job of incorporating the humor of our daily lives into your sketches. Thank you for putting an unforgettable punctuation mark on our conference. The laughter was immeasurable." Whether your team is looking for a fun afternoon of team building games and exercises or a fun day of strengthening communication skills – the common denominator is, you guessed it, FUN! Get ready to get up and moving with Baram and Snieckus. "Yesterday’s improv was great, we really enjoyed it. It set the stage for a great brainstorming session!" It’s that time of year again where you celebrate the hard work of your team. Awards will be given out, pictures will be taken, glasses of wine will be raised and everyone will sit back and cheer! Bring in Baram and Snieckus to help keep things moving with tailor made jokes and wickedly funny improv games relevant to your unique organization. With a roster of professional hosts, B&S will keep things lively while making sure all the hard work everyone has done over the year gets recognized. At the end of the day, trophy or not, your team will always walk away with the prize of laughter! 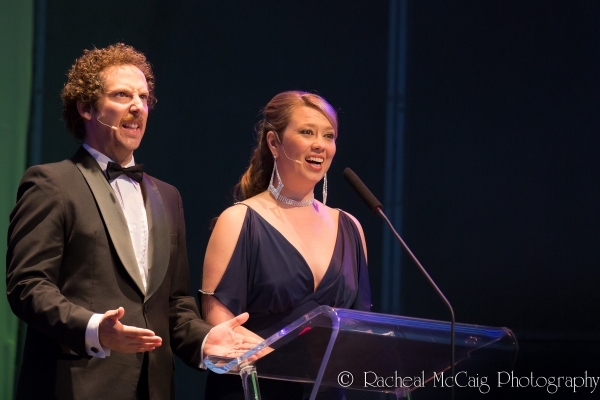 "Our hosts wowed the audience… with their wit and improv chops."